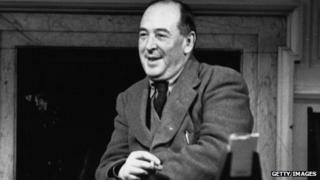 Writer CS Lewis has been honoured with a memorial stone in Westminster Abbey later, 50 years after his death. The stone has been placed in Poets' Corner, alongside renowned literary figures including Chaucer and Dickens. Former Archbishop of Canterbury Dr Rowan Williams - a fan of his work - gave the main address at the ceremony. Lewis, born in 1898, is best known for the Chronicles of Narnia series, which has sold 100 million copies worldwide and been adapted for screen and stage. His other work includes The Screwtape Letters and the Ransom Trilogy novels. The writer was also a respected Oxford scholar and literary critic, while his book Mere Christianity was adapted from a series of BBC radio broadcasts, which sought to explain Christian teachings to a wider audience. CS Lewis's memorial stone is set in the floor of Poets' Corner - though he was not known for poetry - and is inscribed with lines from one of his theological lectures : "I believe in Christianity as I believe the sun has risen. Not only because I can see it but because by it I can see everything else." Around 1,000 guests from around the world attended the service to unveil the stone. Douglas Gresham, the son of Lewis's wife Joy, spoke at the service. The story of the author's marriage to her was told in the film Shadowlands. A conference looking at the impact of Lewis's work has also been taking place at the abbey, while a festival celebrating his life and work has been held in his hometown of Belfast. Clive Staples Lewis - known as Jack to his family - died on 22 November 1963 at the age of 64, the same day President JF Kennedy was assassinated. Other literary greats to be commemorated in Westminster Abbey's South Transept are Samuel Johnson, John Keats and the Bronte sisters.